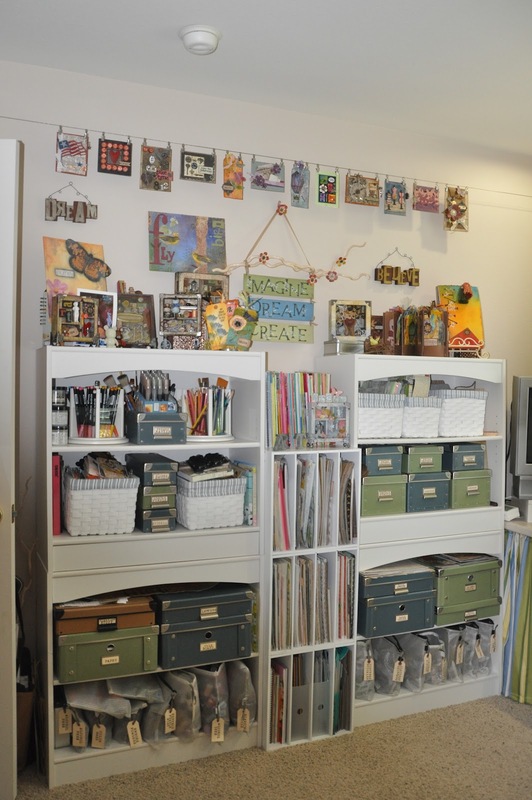 I've been getting organized in my studio since I got back from CHA. 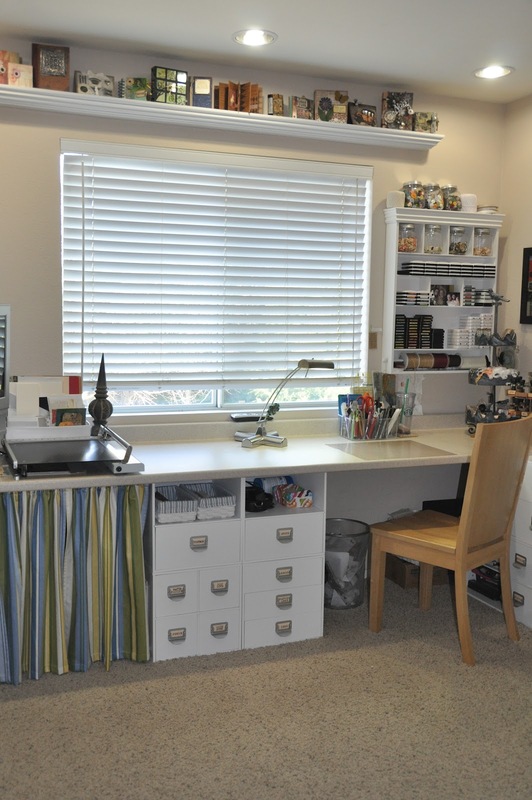 Organizing your studio is almost as important as the creative process itself. I sometimes get frustrated looking for that perfect something to add to my projects when I know I have it but can't find it. Here are a few ideas that work well for me and it will always be a work in progress. This is my wall of wood stamps. The shelves were hand made by my Dad and Son. It's so nice to be able to see them at a glance. 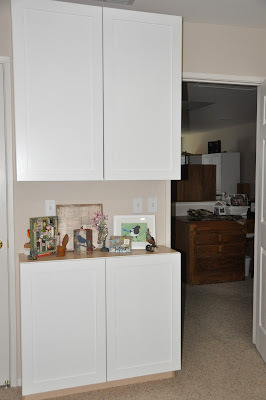 The cabinets below the stamp shelves are from Jetmax Modular storage from Michael's. They have been great for me, I started out with just a few of them and then kept adding as I needed. The drawer next to my work station has some of the products I love and use the most. Dividers come in some of the drawers. They worked great for my Tags and ATC cards. 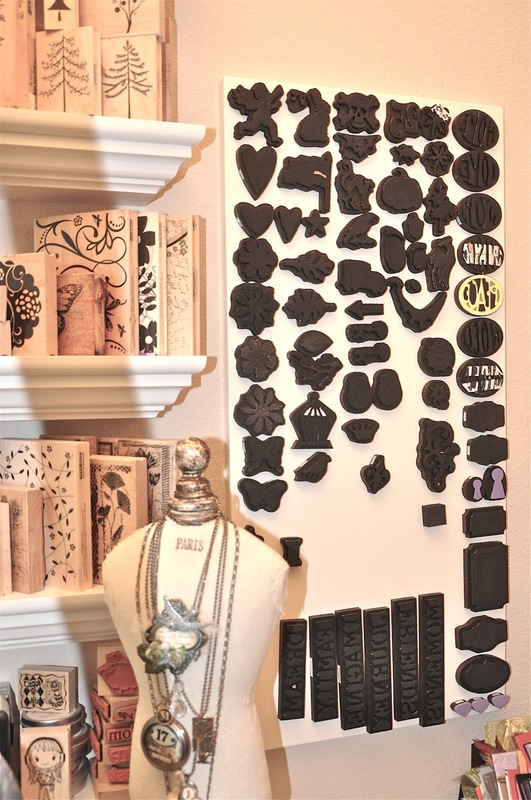 I've collected several dies and embossing folders from the Alterations line. The unit with the 4 cube drawers works great for dies, embossing folders, clear stamps, etc.. This is my work space were I actually get work done. 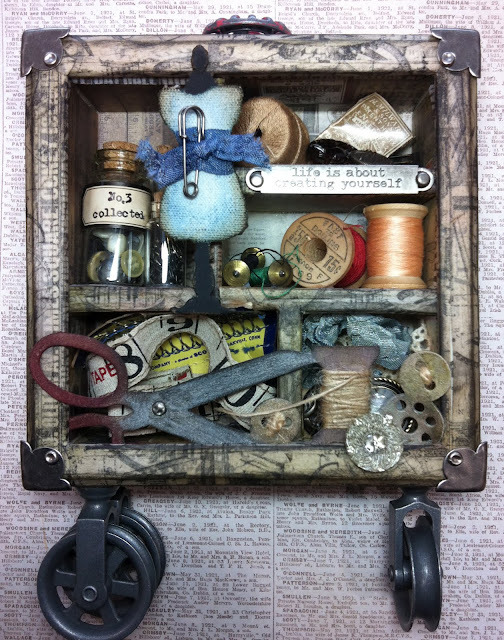 In this little cabinet on the wall I have inks I use the most, buttons and a few spools of twine and ribbon. I also got this at Michael's. Plastic jars hold Buttons, Game Pieces and Watch Parts. Labeling your ink pads on the side really save time. Ranger Ink has downloads for all there inks on the Ranger web site. They now also have Color Swatch Chart down loads to keep track of your pads. 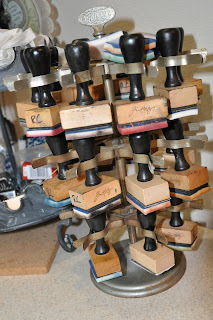 This is an antique stamp holder, works great for my Blending Tool Handles. Next up! Book shelves hold some of my class supplies, art tools like colored pencils and markers. The baskets have ephemera in them. Lots of my art is here for inspiration. Ikea Curtain Wire and Hooks is at the top of the wall, I hang cards there. One package of hooks is not enough. I'll be going back for more. This cabinet was one of those lucky day things! My husband is a contractor and these cabinets wouldn't fit on the job. So, I had to make a sacrifice, take them of his hands and install them in my studio. It was amazing that they fit with only 1" on each side, like they were made for me. Love them! 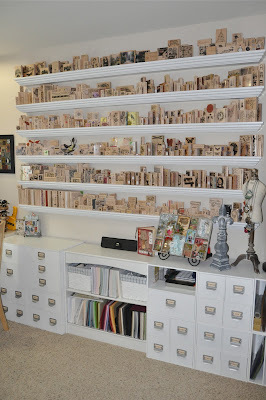 The upper cabinet has all my Tim Holtz cling stamps, they are just on the shelf, no binders just on the shelf like books. I can flip through them very easily to find which ones I need to use. I needed a station for my Vagabond. Off to Ikea I went. I wanted a unit that would be able to roll around the room and this is perfect. 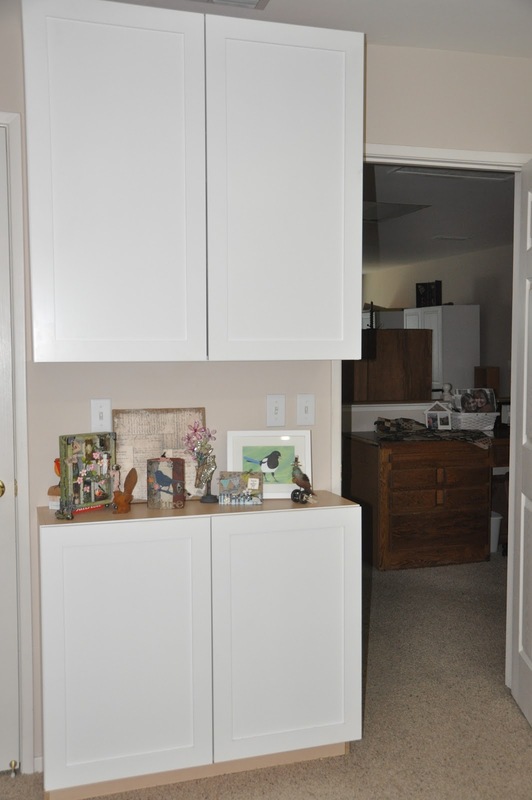 As you can see it has 6 drawers, 3 thin drawers and 3 larger drawers. 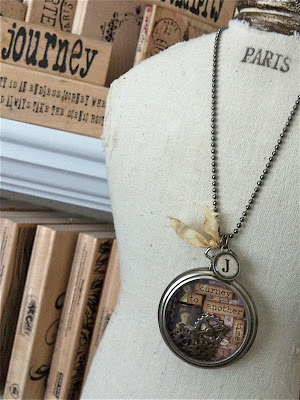 In the thin drawers I have my Idea-ology charms, trinkets, and more. The charms and trinkets are in a Basic Bead Container also from Michael's they are fairly inexpensive. In one of the larger drawers I have all my plates for the Vagabond so they are handy when I need them. 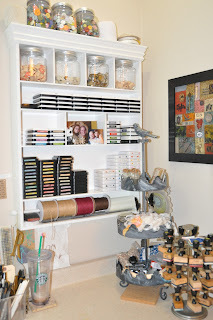 This storage idea comes from my friend Carol. Thanks Carol! You know all those "Movers and Shapers" they are magnetic right. This is a Magnetic Board, from Ikea, they will stick to the board. So your dies are all there at a glance. Please leave a comment with a storage solution from your studio or workspace. Classes coming up at Stampers Corner in Elk Grove, California. 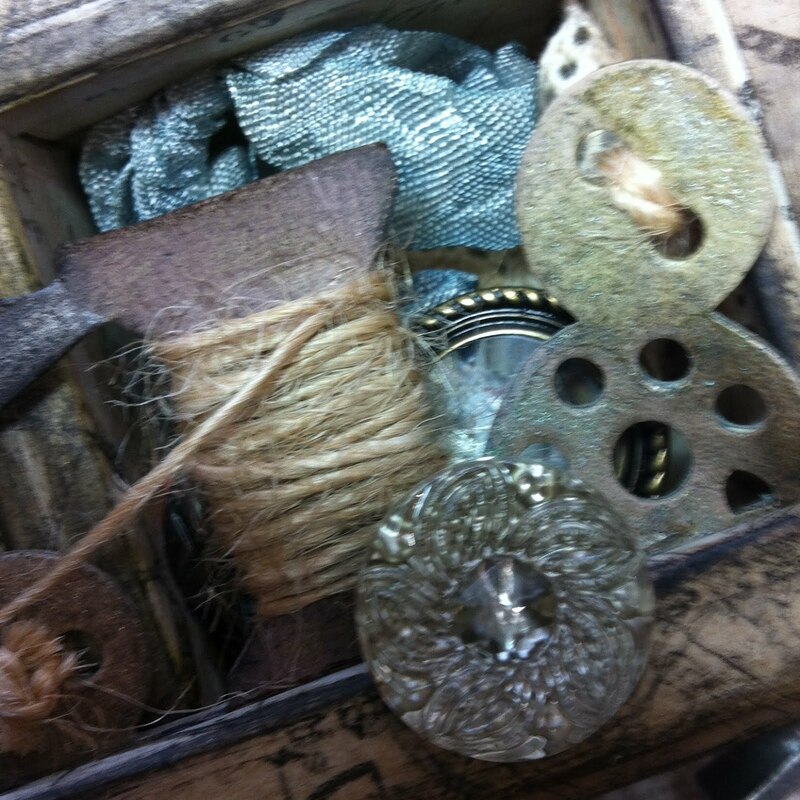 This is a little sneak peak of "My little box of Treasures" class is Saturday, February 25th 10:00 am - 5:00 pm. I only have a few spots left so call to reserve your spot today 916-686-0651. Everything is included in class just bring your tool kit and there will be a one hour break for lunch so you won't get hungry. "Color your world with Copics" on Saturday March 3rd, 10:00 am - 12:30 pm. This is a beginner class for those of you with little to no knowledge of Copic Markers or a refresher corse. We will be making a set of cards in class. Bring your Copic Markers to class. 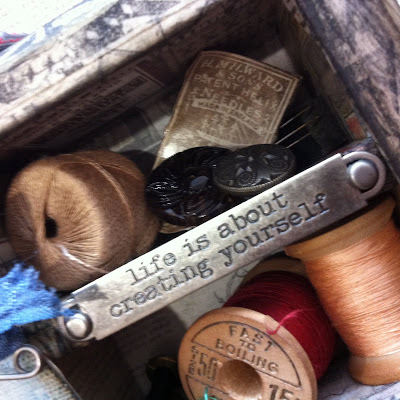 I would love for you to join me for a class! Hope everyone had a great weekend and for some of you the weekend is still going! Yeah! 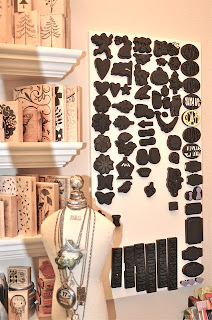 I want to share with you a few more projects that I did for Tim in the Idea-ology booth at CHA. The first project is a necklace "believe in your dreams"
The roses and leaves have been dipped in the Melting Pot full of UTEE. The UTEE coats the roses and creates a hard candy shell. Once the UTEE cools I rubbed Heirloom Gold Perfect Pearls powder on with my finger. 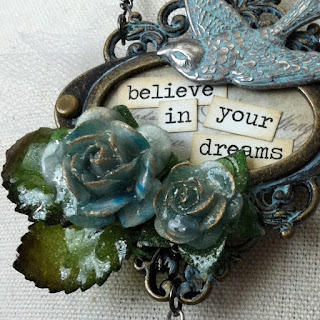 "Believe in your dreams" is from Tim's new Chitchat word stickers. The stickers are different then any others on the market, they have a matte finish so they are inkable. The words come in white and kraft. 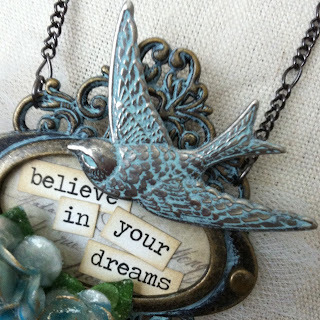 Using Adirondack Acrylic Paint Dabbers in Pool and Aqua, rub the paint into the crevasses of the bird Adornment and Ornate Plate then buff off the excess. This creates a beautiful patina look. This pocket watch features the Chitchat stickers and the new Mini Gears. Using Filmstrip Ribbon, Lost and Found paper stash, Mini Gears, Game Spinners, and Chitchat words make a collage to fit your Pocket Watch. There is some photos in the paper stash that are a perfect fit for the Filmstrip Ribbon. A few of the Mini Gears are floating freely under the glass. 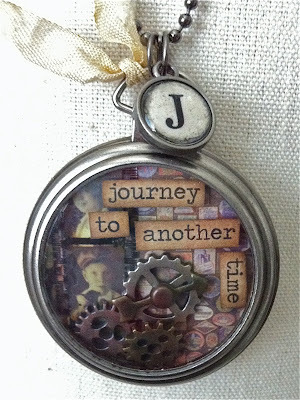 Finally add a Word Charm and some Crinkle Ribbon to the top of the watch. 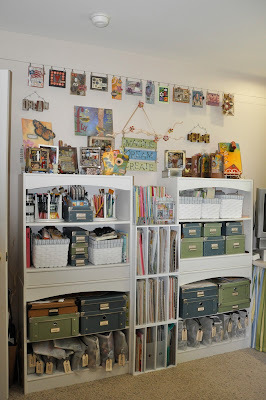 I've been cleaning my studio and I hope to post some picture of some cool storage ideas latter this week. I hope everyone had a fabulous Valentines Day! 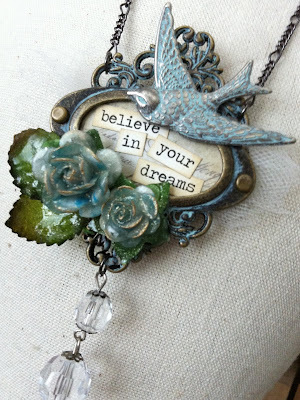 I've joined the amazing design team at Inspiration Emporium. 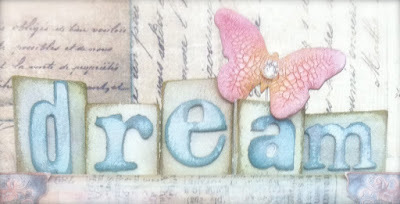 Tim's Alterations Butterflight On the Edge Die. Head on over to see how I made it and say hi to my friends at Sizzix. 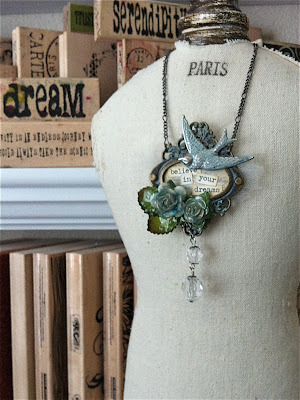 I wanted to share a project I did for the Idea-ology booth at CHA. The inspiration came from my husband Del's Grandmothers sewing box. I found some old treasures to use in the configuration box like old bobbins, buttons and even some spools of thread. Can you believe a spool of thread was only 15 cents? 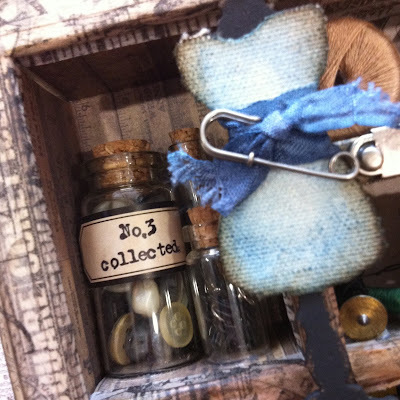 A little vile of old buttons and another with snaps and things adorn the little compartment behind the dress form. I adore the new Wire Pin at the waist of the dress form. 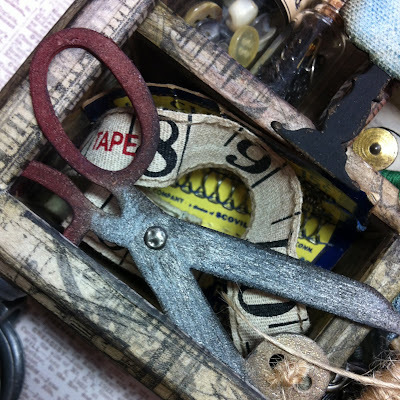 Love this on the edge die, the scissors are to cute for words. A must have! The edge die even has a few buttons and a little spool of thread. I also like the new Word Bands, I will be using them on lots of future projects. They easily are attached with brads or you could use a ribbon to thread through the holes on each end. 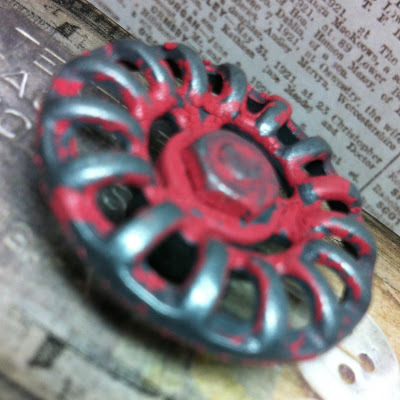 The Faucet knobs are paintable and after the paint dries you can chip off some of the paint for a real vintage look. Down to the bottom where the box sits the Pulley Wheels are fun to use. With Valentine's Day right around the corner this card is a great choice for your sweetie. I used Worn Lipstick and Festive Berries Distress ink on the Valentine Silhouette set from Stampers Anonymous. After inking the stamp, I spritz it with a little water then stamped it on the front of my card. Once the ink was dry I embossed it with the matching texture fade. Lightly inked the edges of the card with Worn Lipstick using an ink blending tool and foam. Now use the mini Love Struck set and die cut the cupid and heart form grunge board. Paint the cupid with Barn Door distress stain and the heart with Snow Cap acrylic paint dabber. Let dry. Spray the cupid with Forever Red - Perfect Pearl mist and the heart with Perfect Pearl - Perfect Pearl Mist and let dry. You can use a Heat-It Tool to speed up the dry time. Add a doily (i inked under the doily first with Worn Lipstick distress ink on my ink blending tool) You could also use the distress doily die from the alterations line. Wrap bakers twine around the card add a key and tie with a bow. Send it to someone special. They have the key to your heart! Up, Up, and Away Tag!